Low Smoke incense from Japan. Nippon Kodo makes the popular Seiun Chrysanthemum as well as the Scent of Blossoms in the Wind series. Higher charcoal content in less smoke incense means the incense burns red hot, yielding minimal smoke. 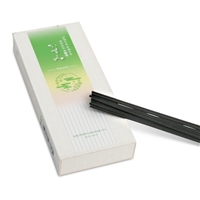 High-quality incense sticks imported from Japan. The Incense sticks here are 5.5" long, burning for about 25 minutes. The perfect way to time a meditation session. Larger boxes are a value. Contact us for advice - we burn what we sell!